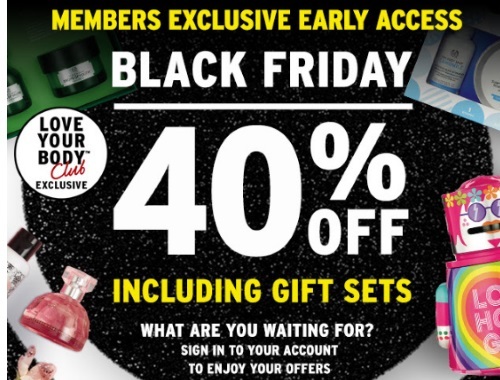 The Body Shop Love Your Body Club members get a Black Friday Preview today! Sign into your account to enjoy the special offers early! Get Early Access to The Body Shop's Exclusive Black Friday preview with 40% off sitewide plus 40% off gift sets! There is also a Black Friday tote only $40 (a $125 value) no minimum purchase required! Offers are valid November 15-16, 2017 More deals coming during Black Friday Week November 17-22.